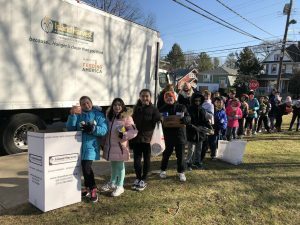 Marion Street Elementary School students participated in a Grinch for Good initiative last month, successfully collecting 3,650 pounds of food for Island Harvest, a food bank that serves the hungry across Long Island. The abundance of food donations will provide 3,042 meals for families in need. Students across the nation participated in the Grinch for Good initiative by doing acts of kindness and donating to Feeding America, which Island Harvest is a member of. The initiative focused on growing students’ hearts and fostering a growth in civic responsibility. 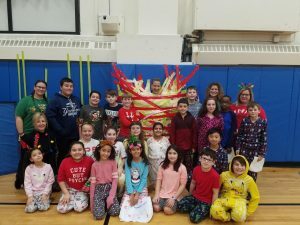 Christine Castellano and Michelle Puglisi’s fourth-grade class led the initiative, which was supported by the Marion Street Student Council. Students set class goals to bring in food and were supported by their families, neighbors and places of business. The initiative ran through the month of December and ended with a “Tape Your Principal to the Wall” assembly to celebrate the successful food drive. 1) Marion Street Elementary School students dropped off donated food items for Island Harvest. 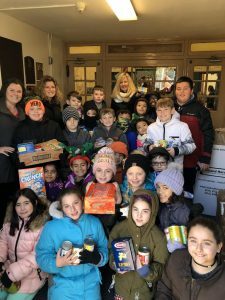 2) Marion Street Elementary School students collected more than 3,000 food items for Island Harvest, a food bank serving Long Islanders. 3) Principal Theresa Macchia was taped to the wall by students at the end of the successful food drive.